Mikä on se alue, jolla subjekti – henkilö tai ryhmä henkilöitä – jätetään tai tulisi jättää tekemään sen mihin tämä on kykenevä tai olemaan se mikä hän voi olla, ilman muiden ihmisten asiaan puuttumista. Mikä tai kuka on se hallinnan tai asioihin puuttumisen lähde, joka voi määrätä jonkun olemaan tai tekemän jotakin nimenomaista eikä jotakin muuta. The two questions are clearly different, even though the answers to them may overlap. I am normally said to be free to the degree to which no man or body of men interferes with my activity. Yleensä ihmisen sanotaan olevan vapaa silloin, kuin kukaan muu ihminen tai ihmisryhmä ei puutu hänen toimintaansa. Political liberty in this sense is simply the area within which a man can act unobstructed by others. Poliittinen vapaus on tässä merkityksessä yksinkertaisesti se alue, jolla ihminen voi toimia toisten estämättä häntä. Ihmiseltä puuttuu poliittinen vapaus vain silloin kui muut estävät häntä saavutamasta tavoitettaan. By being free in this sense I mean not being interfered with by others. The wider the area of non-interference the wider my freedom. Tarkoitan tässä merkityksessä vapaalla ihmisellä sellaista, jonka asioihin toiset ihmiset eivät puutu. Mitä laajempi on alue, jolla muut eivät puutu tekemisiini, sitä vapaampi olen. Kaikki on sitä mitä on; vapaus on vapautta, ei yhdenvertaisuutta, oikeudenmukaisuutta, ihmisen onnea tai puhdasta omaatuntoa. Yet it remains true that the freedom of some must at times be curtailed to secure the freedom of others. Silti pitää yhä paikkansa, että joidenkin vapautta joudutaan ajoittain toisten vapauden turvaamiseksi. It is that liberty in this sense is not incompatible with some kinds of autocracy, or at any rate with the absence of self government. Liberty in this sense is principally concerned with the area of control, not with its source. Vapaus tässä mielessä voidaan yhdistää jonkinlaiseen autokratiaan tai ainakin itsehallinnon puuttumiseen. Vapaus tässä mielessä koskee periaatteessa hallinnan aluetta, ei sen lähdettä. Just as a democracy may, in fact, deprive the individual citizen of a great many liberties which he might have in some other form of society, so it is perfectly conceivable that a liberal-minded despot would allow his subjects a large measure of personal freedom. Demokratia saattaa itse asiassa riistää kansalaisilta lukuisia vapauksia, jotka jokin toisenlainen yhteiskunta sallii hänelle, ja vastaavasti on täysin kuviteltavissa, että vapaamielinen itsevaltias suo alammaisilleen laajat henkilökohtaiset vapaudet. There is no necessary connection between individual liberty and democratic rule. The answer to the question “Who governs me?’ is logically distinct from the question ‘How far does government interfere with me? It is in this difference that the great contrast between the two concepts of negative and positive liberty, in the end, consists. Yksilön vallan ja demokratian välillä ei ole välttämätöntä yhteyttä. Vastaus kysymykseen: “kuka hallitsee minua?” on loogisesti erillään kysymyksestä: “Miten pitkälti hallitus puuttuu asioihini?” Negatiivisen ja positiivisen vapauden käsitteiden tärkeä vastakkainasettlu perustuu viime kädessä juuri tähän eroon. The ‘positive’ sense of the word ‘liberty’ derives from the wish on the part of the individual to be his own master. I wish my life and decisions to depend on myself, not on external forces of whatever kind. Vapaus-käsitteen “positiivinen” merkitys juontuu yksilön toiveesta olla oma herransa. Haluan elämäni ja päätösteni riippuvan minusta itsestäni, en mistä ulkoisista voimista. But the ‘positive’ conception of freedom as self mastery, with its suggestion of a man divided against himself, has in fact, and as a matter of history, of doctrine and of practice, lent itself more easily to this splitting of personality into two: the transcendent, dominant controller, and the empirical bundle of desires and passions to be disciplined and brought to heel. Positiivinen tulkinta vapaudesta itsehallintana ja sen ehdotus ihmisen jakautumisesta itseään vastaan, on tosiasiassa ja historiassa, sekä opin että käytännön tasolla, mukautunut helpoimmin persoonallisuuden halkomiseen kahtia, toisaalta transsendenttiin, hallitsevaan kontrolloijaan ja toisaalta empiiriseen halujen ja intohimojen kimppuun, joka täytyy alistaa ja panna kuriin. This demonstrates […] that conceptions of freedom directly derive from views of what constitutes a self, a person, a man. Enough manipulation of the definition of man, and freedom can be made to mean whatever the manipulator wishes. Vapauskäsitys määrittyy suoraan siitä näkökulmasta minkä katsotaan muodostavan itsen, henkilön, ihmisen. Tarvitaan vain tarpeeksi ihmisen määritelmän manipulaatiota ja vapaus voidaan saada tarkoittamaan ihan mitä tahansa manipulaattori haluaa. The consequences of distinguishing between two selves will become even clearer if one considers the two major forms which the desire to be self-directed – directed by one’s ‘true’ self – has historically taken: the first, that of self-abnegation in order to attain independence; the second, that of self-realisation, or total selfidentification with a specific principle or ideal in order to attain the selfsame end. Kahden itsen erottamisen seuraukset käyvät vielä selvemmiksi, kun tarkastellaan kahta keskeisintä muotoa, joissa halua ohjata itseään – tulla “todellisen” itsen ohjaamaksi – on historiallisesti esiintynyt. Ensimmäinen niistä on riippumattomuuden saavuttamiseksi harjoitettu itsekieltäymys. Toinen on itsensä toteuttaminen eli täydellinen itsensä samaistaminen erityiseen periaatteeseen tai ideaaliin tuon päämäärän saavuttamiseksi. Ascetic self-denial may be a source of integrity or serenity and spiritual strength, but it is difficult to see how it can be called an enlargement of liberty. If I save myself from an adversary by retreating indoors and locking every entrance and exit, I may remain freer than if I had been captured by him, but am I freer than if I had defeated or captured him? If I go too far, contract myself into too small a space, I shall suffocate and die. The logical culmination of the process of destroying everything through which I can possibly be wounded is suicide. While I exist in the natural world, I can never be wholly secure. Total liberation in this sense (as Schopenhauer correctly perceived) is conferred only by death. That is the metaphysical heart of rationalism. The notion of liberty contained in it is not the ‘negative” conception of a field (ideally) without obstacles, a vacuum in which nothing obstructs me, but the notion of self-direction or self-control. I can do what I will with my own. I am a rational being; whatever I can demonstrate to myself as being necessary, as incapable of being otherwise in a rational society – that is, in a society directed by rational minds, towards goals such as a rational being would have – I cannot, being rational, wish to sweep out of my way. I assimilate it into my substance as I do the laws of logic, of mathematics, of physics, the rules of art, the principles that govern everything of which I understand, and therefore will, the rational purpose, by which I can never be thwarted, since I cannot want it to be other than it is. If this leads to despotism, albeit by the best or the wisest – to Sarastro’s temple in The Magic Flute – but still despotism, which turns out to be identical with freedom, can it be that there is something amiss in the premisses of the argument? That the basic assumptions are themselves somewhere at fault? that when all men have been made rational, they will obey the rational laws of their own natures, which are one and the same in them all, and so be at once wholly law-abiding and wholly free. It is not with individual liberty, in either the ‘negative’ or the ‘positive’ sense of the word, that this desire for status and recognition can easily be identified. It is something no less profoundly needed and passionately fought for by human beings – it is something akin to, but not itself, freedom; although it entails negative freedom for the entire group, it is more closely related to solidarity, fraternity, mutual understanding, need for association on equal terms, all of which are sometimes – but misleadingly – called social freedom. 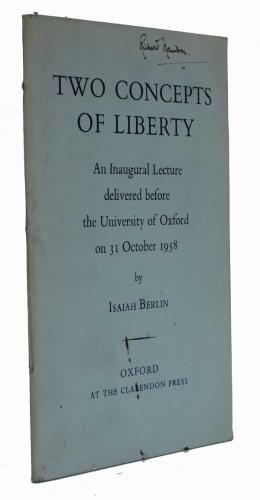 The essence of the notion of liberty, in both the ‘positive’ and the ‘negative’ senses, is the holding off of something or someone – of others who trespass on my field or assert their authority over me, or of obsessions, fears, neuroses, irrational forces – intruders and despots of one kind or another. The desire for recognition is a desire for something different: for union, closer understanding, integration of interests, a life of common dependence and common sacrifice. Few governments, it has been observed, have found much difficulty in causing their subjects to generate any will that the government wanted. The triumph of despotism is to force the slaves to declare themselves free. It may need no force; the slaves may proclaim their freedom quite sincerely: but they are none the less slaves. Perhaps the chief value for liberals of political – ‘positive’ – rights, of participating in the government, is as a means for protecting what they hold to be an ultimate value, namely individual – ‘negative’ – liberty. I do not wish to say that individual freedom is, even in the most liberal societies, the sole, or even the dominant, criterion of social action. We compel children to be educated, and we forbid public executions. These are certainly curbs to freedom. The extent of a man’s, or a people’s, liberty to choose to live as he or they desire must be weighed against the claims of many other values, of which equality, or justice, or happiness, or security, or public order are perhaps the most obvious examples. For this reason, it cannot be unlimited. We are rightly reminded by R. H. Tawney that the liberty of the strong, whether their strength is physical or economic, must be restrained. This maxim claims respect, not as a consequence of some a priori rule, whereby the respect for the liberty of one man logically entails respect for the liberty of others like him; but simply because respect for the principles of justice, or shame at gross inequality of treatment, is as basic in men as the desire for liberty. Pluralism, with the measure of ‘negative” liberty that it entails, seems to me a truer and more humane ideal than the goals of those who seek in the great disciplined, authoritarian structures the ideal of “positive” self-mastery by classes, or peoples, or the whole of mankind. It is truer, because it does, at least, recognise the fact that human goals are many, not all of them commensurable, and inperpetual rivalry with one another.